1. Pertaining to a period before time began. 2. The dating of an event as earlier than its actual occurrence. 1. To make an official announcement by word of mouth in some public place; also, to cause this to be done by officers or agents: The President proclaimed a national day of mourning for the brave soldier who died in an auto accident. 2. To make a public declaration of war against another power; to declare war: The first minister for the country stood on the balcony, proclaiming that a state of peace no longer existed between his country and the nation on the other side of the river. 3. To declare publicly; to make known aloud or openly; to publish: A ritual at the church was to proclaim the upcoming marriage ceremony of couples in the congregation. After winning every competition in tennis at his university, Clarence was proclaimed "campus athlete of the year". 4. Etymology: from Latin proclamare "to cry or to call out", from pro-, "forth" + clamare, "to cry out". 1. Publicly and officially announced; publicly declared by a special decree or pronouncement: The children were excited about the upcoming proclaimed holiday which was an additional day to celebrate the acquisition of a new athletic field for sports. 2. Of a district or place that is controlled by special legal restrictions: The proclaimed property on the island was governed by an absentee landlord through a hired agent. Someone who announces or makes something publicly known: The local village held an annual contest to select the town proclaimer for the year, a person who would announce the dates of athletic competitions and other events involving the community. 1. An official public notice: The written proclamation regarding snowplowing was posted at the court house and on various buildings around the town. 2. The public and formal announcement of the accession of a king or ruler: The proclamation of the crowning of the king was preceded by much fanfare by trumpets and drums. 3. The action of denouncing as illegal, a district to be under legal restriction, etc. : The proclamation which was posted at the federal building and post offices identified the bank robbers and advertised a reward for their capture. 4. A formal order issued by a sovereign or other legal authority and made public either by being announced by a herald, or by being posted in public places: During Medieval times, a royal messenger would ride across the countryside, announcing the government's latest proclamations in town squares. An individual who makes official public announcements: John Smith was appointed to be the proclamator for the local rural courts that dealt with cases involving local citizens. 1. Descriptive of the process of making a public announcement: The proclamatory nature of the notice posted in the government building underscored the importance of the information therein. 2. A reference to the redevelopment of soil so it is good for cultivation: The soil reclamation specialist used several proclamatory minerals and fertilizers to bring the land back to a condition that would be acceptable for cultivation. The killing of offspring; specifically, the crime of destroying offspring either before or soon after birth. Steep; a steep incline; such as, of a hill or a road. 1. A natural inclination, or tendency, to behave in a certain way: There are some people who have a proclivity for violence or stealing from others. Peggy has a proclivity for having sweet deserts after most of her lunches and dinners. 2. 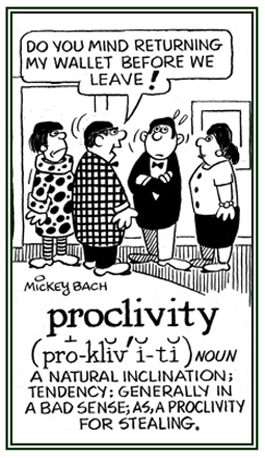 Etymology: from Latin proclivitatem, proclivitas, "a tendency, propensity" from proclivis, "prone to"; literally, "sloping", from pro-, "forward" + clivus, "a slope". 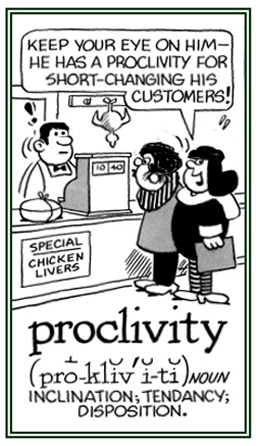 Proclivity is someone's disposition which shows a tendency to do or to behave in a certain way, as if leaning toward it. 1. Having the incisor teeth directed forward. 2. Inclined; tending by nature. 1. A governor of an ancient Roman province, usually a former consul. 2. A governor or administrator of a colony or other dependency or an occupied area. 3. A senior administrator with broad powers in a nation recently invaded and under the control of the invader's armed forces, charged with pacifying the population, restoring vital services, and establishing a new governance. 4. Etymology: "governor or military commander of an ancient Roman province"; from Latin proconsul, from the phrase pro consule, "(acting) in place of a consul"; from pro-, "on behalf of, in place of, before" + consul, "magistrate in ancient Rome"; probably originally "someone who consults the Senate" from consulere, "to deliberate, to take counsel or advice." 1. To put off until another day or time to accomplish something which really should be done: Shanna was procrastinating and not getting her assignment done for her class and the teacher would have given her a failing grade if she had procrastinated one more day. 2. 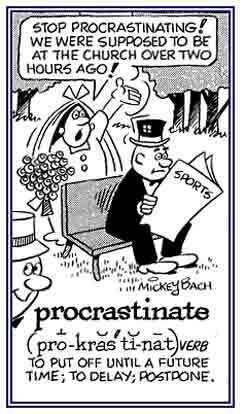 To delay doing something until another time because a person doesn't want to do it or simply can't complete it: There are those who procrastinate doing exercises and put themselves in danger of having a less than desirable physical condition. 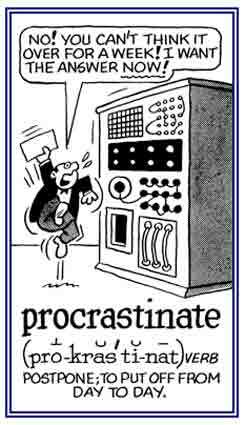 There are some people who procrastinate because they have so much to achieve that it is impossible to complete everything at the same time! A reference to an action which has been put off until some other time, if it will ever be done: "As a procrastinated person, Fern admitted that she feels that there is nothing easier than not being able to find time to do the things that she doesn't want to do." 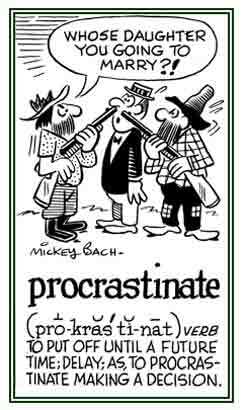 A reference to putting off an obligation, or responsibility, until some undetermined tomorrow: "Sean procrastinatingly admits that he can't take now for an answer and that he has a wait problem."